My husband and I live in a country home situated on the Assiniboine River Valley on the Saskatchewan-Manitoba border in Canada. We enjoy travel, meeting people and learning about world cultures. Our two adult children and their partners have also traveled extensively. We have traveled together as a family to India, New Zealand, Australia, Europe and Mexico. 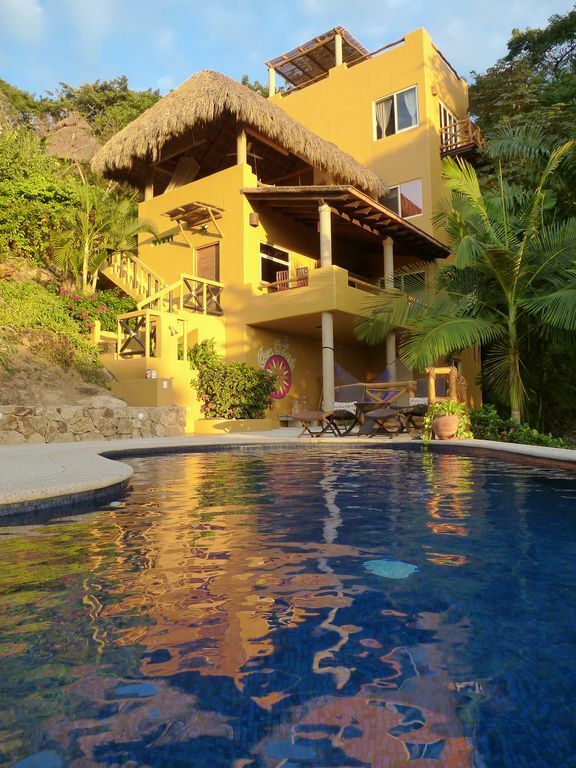 Now, in semi-retirement, we have decided to purchase a home in Sayulita - a place where we could spend time together as a family or on our own. We fell in love with the 'feel' of Sayulita. The intimate small-town atmosphere of the community is the perfect fit for us and our family. We are 'small-town' people who take much pleasure in the arts, sports and adventure. Sayulita and area offers all of that. The down-town market, the art galleries, the cafes and cantinas, the beach activities and the hiking possibilities excited us. The proximity to the Puerta Vallarta airport and the amenities of the city were also a draw for our family. When we decided to look for a property there were two important prerequisites for us. One was the necessity of an ocean view. Perhaps this comes from being prairie folk who are accustomed to a 'big' view of the sky. The other was the privacy that Casa OLayh offers, with enough space to house six-eight people comfortably. We think we have the perfect spot - tucked at the end of a quiet, gated lane with a wonderful ocean view and only a short stroll to downtown. We were caught by the design of the casa and the Mexican 'feel' of the house from the colour of the walls to the Mexican tiled floors. The open concept of the main living area that spills over to the terrace to meld the interior with the exterior was what we were looking for. The upper floor that could be a separate living space or just another storey in the house was just right for our family and we thought it would be 'just right' for other families too. The kitchenette allows the upper floor guests the opportunity for a private breakfast or dinner. The large palapa & lounge area is perfect for an afternoon or evening get-together. We have decided to add an additional bedroom/bathroom to the Casa. Also, we are excited for the addition of a large in-ground pool. Bathrooms are large with modern facilities. There is ample closet and storage space in all bathrooms. Thank you. We are delighted that you enjoyed our Mexican home and would love to have you back! We started at the Casa Olayh with 5 girlfriends for a week to celebrate a big birthday. It was truly a fabulous time. Love the pool and used it multiple times each day. The location of the casa was close enough to walk into town, yet we were up in the trees with great views. Like a little oasis. Very private. Thank You !! So glad you enjoyed our Casa. For all the reasons you stated, and more - we love it and can't wait until January when we can escape the Canadian cold for the sunny clime of Sayulita! Casa Olayh was a huge property that met all our needs. Unfortunately it’s mosquito season and we could not deal with all the mosquito bites. My advice don’t book in the summer House is not mosquito protected. No screens on windows or doors. My family could not stop commenting on what a special house this was. The design lends to multiple spaces where members can hang out and enjoy the breezes and view. The pool was extra special after a hike up the dusty road that was a real work out. A work out that was needed after all the great food and alcohol that was being consumed, so we really didn't complain. The lush landscaping really helped with shade and a feeling of being in a jungle, not in dried up brush which surrounds many of the hillside homes. Birds were a delight. Jan and Ramon were very helpful. We needed more drinking water and Ramon had it delivered in less than 10 minutes after our request. The pictures of the Casa are accurate. Very clean. Just fantastic. We are delighted to share our Casa with guests who enjoy it as much as we do. We just spent a whole month in Sayulita at Casa OLayh and would highly recommend it. One of the best things about the Casa is its location. For us, it was just perfect. It is far enough away from town that we were afforded peaceful nights for sleeping and peaceful days for lounging by the pool. It wasn’t too far however, so that the walk in to town wasn’t too onerous. Also, although there is a bit of a small hill (just at the end, the final road up to the Casa), it wasn’t too steep (like Nanzal hill) but enough to provide some amazing views and gorgeous sunsets, especially on the upper levels. Also, being on the North side, if you are a bird lover, it is a great spot for watching. I saw so many birds, some of which I learned later are only in a small area on the west of Mexico and not always easy to spot. The Chachalacas are eager to converse in the morning. We got used to them, but if you are a light sleeper, and want to sleep in, you may need earplugs. The other great thing about the location is that we often got some lovely breezes at the Casa. The heat would sometimes get too much for the kids in town, and it was refreshing to get back to cool off in the pool and catch the breeze. The pool was a godsend. We did admittedly spend more time there then at the beach. The rooms are very comfortable (in size and furnishings) and nicely decorated. The artwork (most of it Jan’s) is also a very lovely touch. The amenities allowed our month-long stay to be comfortable. We didn’t feel like we were lacking in anything to make breakfasts, lunches, snacks, or even dinners. Also, the staff were very friendly and kind and the property manager was very attentive. He was easy to reach regarding any issues and very responsive in terms of dealing with them. There were never big issues, the biggest probably being lack of running water (which is not a problem specific to Casa OLayh, but to Sayulita), but they were always dealt with quickly and professionally. I was always impressed with Ramon. And the owners were also very lovely and easy to deal with. Jan even checked in with us throughout our stay to make sure things were going well. All in all a fantastic place. Not a choice you would regret. Just returned from spending two amazing weeks at Casa Olayh. We were a party of six and the house layout was just perfect. The three in-suite King size bedrooms on separate floors provided plenty of space and privacy for all. Every level of the house has spectacular views of the ocean and the sunset. The trip up the spiral staircase to the top level is a bit daunting but well worth it. The owners installed a mini fridge up top so cocktail hour on the roof was a no brainer. The house also comes with a brand new infinity pool which is really lovely and was a refreshing and welcome break from beach. The property manager and the staff were extremely responsive and handled all of our questions and requests , including arranging for in house catering. While the Casa is within walking distance to the beach and the downtown, you might want to consider renting a golf cart or two. Sayulita is a cool little town with many nice shops and good restaurants. We all fell in love with the town and it's people!